new moon - is now a reality once a month as long as the cloud cover co-operates. Being nearly 140km north of the Greater Toronto Area and 90km north of the next biggest town, Orangeville, you wouldn't think that the light pollution would play much of a role, but as you can see - it still does with the yellow glow on the high-altitude clouds sitting just above the horizon. I shot this on my Canon 6D secured to a tripod. Exposure was set to ISO 1600 f/2.8 and 20 seconds. Captured in RAW, I used a white balance of 3700 Kelvin. How did I arrive at those settings? Well its nice to start off with a wide open aperture, this maximizes the light you bring to your sensor for any given duration of exposure. The caveat of being wide open, is that it can be harder to achieve proper focus, and most lenses are often sharper when they have been stopped-down. So there is a little trade-off there. And then just boost ISO until you get the exposure and contrast you're happy with without sacrificing too much noise by going very high ISO. So whats with the 600/28 formula? We all know that the stars move across the sky the same way the sun does. Actually its planet earth that is moving, but that is beside the point. So in order to get stars that are acceptably sharp, while maximizing exposure time, you take 600 and divide it by the 35mm equivalent focal length. So if you're on a crop sensor like APS-C (1.6x) for the same 28mm lens, you would take [ 600 / (28x1.6) = 13.39s ], significantly cutting down the exposure time. There is a way around having to use this formula - motorized equatorial mounts. They counter-act the rotation of the earth by moving your camera at a constant speed, relative to the earths rotation. Because it essentially negates the rotation, this keeps the star that was in the centre of the frame in the centre of the frame for as long as it is visible in the sky, and instead causes the stationary landscape in the photo to show the motion blur. The problem with motorized equatorial mounts is that a good entry level one is going to start at about $400. 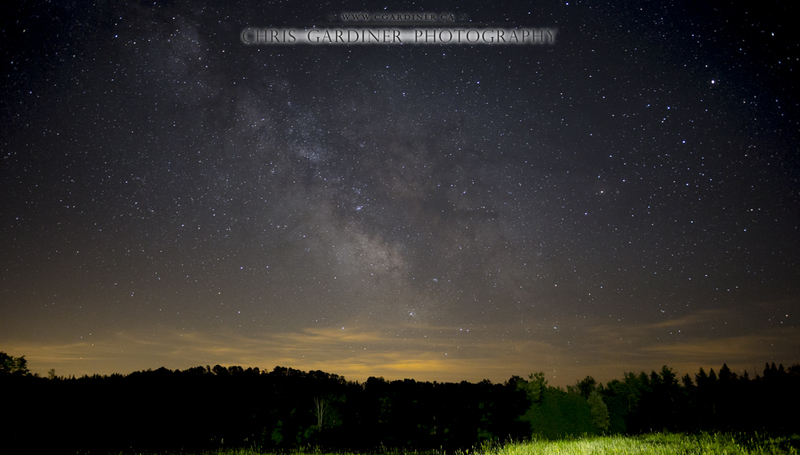 How about if you live in the city and still want to shoot the night sky? All hope is not lost. There are actual Light Pollution filters that cut out the specific bandwidths of light used by majority city lights. By cutting out specific bandwidths, you're essentially making that colour of light invisible to your camera, allowing you (your camera) to see right through it. It won't really help you see it with your bare eye, and you'll need some help on pointing your camera, but you just might find you'll be impressed with the images you catch. I don't have an LP filter but if I move into the city again, I probably will. I hope you enjoyed this post on astrophotography. Thanks for reading and don't be afraid to share it with someone you know who will appreciate it!